by marc / Tuesday, 05 February 2019 / Blog Category: Everything Vegas. I really enjoyed the years milling about downtown Manhattan. Since leaving New York, I’ve come to appreciate that unique environment even more. There’s no part of Las Vegas that can replace that atmosphere. I’m not sure if that gritty environment still exists in New York with businesses closing and gentrifying neighborhoods but that’s a story for another time. Distance has only made the heart fonder for the good ole days in downtown NYC. Venues with that distinct vibe pop up every now and again in Las Vegas. The Beat Coffeeshop in downtown Las Vegas is now closed but was the first place that reminded me of that relaxed but go-go vibe of downtown New York. Downtown Las Vegas no longer has the great coffee shop but Evel Pie brings a similar vibe (and a delicious slice of pizza) to downtown Las Vegas. As a transplant from New York, it’s great to find new bars and restaurants that exude my hometown. This concept of the outdoor “park” and hotel very much evoke a feeling of New York City. Even though the area feels like a sanitized replica, it can still feel like New York City. Shake Shake, Eataly, NoMad hotel, and the ample outdoor seating offer a likeness to New York City that people will love and hate. This isn’t the gritty downtown New York experience but it’s definitely reminiscent of different parts of the great city. This past summer Ghost Donkey opened inside the Block 16 Food Hall at The Cosmopolitan. Without knowing the history of Ghost Donkey, I felt like I was zipped back in time to one of the unique bars I used to visit in downtown Manhattan. Lo and behold, the original Ghost Donkey is on Bleeker Street in downtown Manhattan. 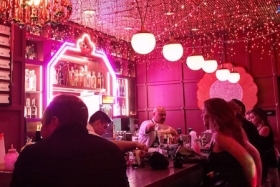 Besides the tequila and mezcal cocktails, the atmosphere at Ghost Donkey is unlike any other bar in Las Vegas. The drinks are good but this is a must visit, just to see what the bar looks like. It was nice to be surprised by this slice of New York hidden behind an exit door that’s marked by a donkey. Another restaurant with a distinct New York City vibe is coming to Las Vegas in 2019. The Greene Street Kitchen will open at the Palms soon. The new restaurant will pay homage to the artistic communities New York’s SoHo neighborhood during the early ‘80s with a collection curated by Tal Cooperman, Palms’ Creative Director. The Greene St. Kitchen experience will begin immediately upon arrival. Guests will enter a secret vintage video arcade “speakeasy” with classic games lining the walls and a 1980s 8-bit video-inspired tiled floor. A vending machine “door” will lead guests through a tunnel and into the restaurant’s main bar and lounge. This place sounds awesome and I can’t wait to see what it’s like when they open. Keep your eyes peeled for more information as the opening date gets closer.